Once you've surrendered yourself to the juicy world of chicken thighs you'll recognise fellow converts everywhere you go. They'll have a familiar glint in their eye, that look which seems to say 'I know the meat is juicier than breast, and the skin crispier than leg'. 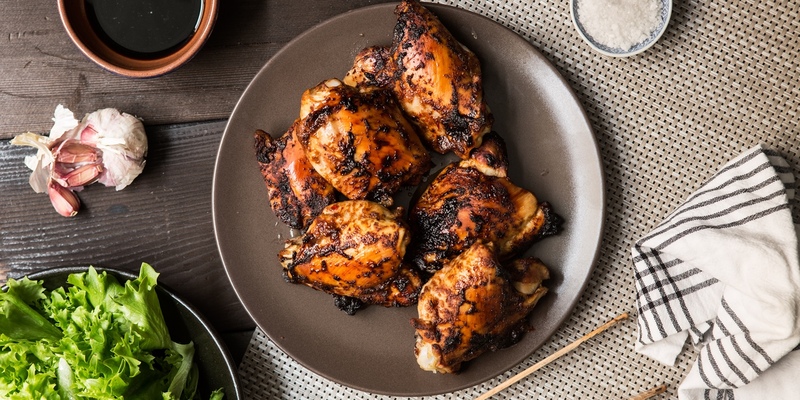 Yes, a plump chicken breast has its place on every dinner table and no picnic or barbecue would be complete without a drumstick or two, but there's something so succulent and special about thigh meat that its comparatively low price seems like the food world's biggest secret. Browse our collection of chicken thigh recipes to find new inspiration for preparing this most unsung of cuts. Karen Burns Booth's Gurkha curry recipe makes a cheap and delicious midweek meal when prepared with thigh meat, or try her simple Chicken satay for a Thai treat everyone will enjoy. This collection also showcases recipes for elegant dishes fit for the weekend and special occasions. Rukmini Iyer's chicken pie recipe combines meltingly tender slow-cooked chicken with filo pastry, walnuts and pomegranate molasses, while Paul Welburn's playful croquettes are inspired by the classic flavours of chicken Caesar salad.